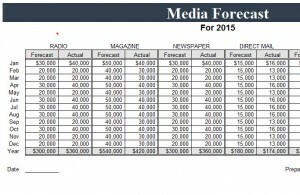 Stay on top of your media coverage budget this year with the Multi-Channel Forecast Template, designed for your convenience. Using this template, you can easily organize all of the media outlets for your business or non-profit organization. Don’t let a cent fly by; download this template today to start organizing and analyzing your media coverage needs! Start by downloading the media budget file below. Once you click on the new document, you are ready to start optimizing your Forecast Template. This media template is the perfect tool for any organization to stay on track with their media coverage needs and their budget. Simply click on any cell and start typing to change the stock information. The template will automatically calculate the information you entered to give a convenient total at the end. The sections are labeled so you can track each month. This will help you recognize trends in your spending, and also in the prices of different media outlets throughout the year. This media template will also contrast your projected budget with the actual cost as you update the information each month. After you’re all done entering the data for your budget, head toward the “File” tab in the top left corner, and select the “Print” option to have the file sent to your printer. You can also choose the “Save As” button to safely keep the Forecast Template on your computer. Why Use the Multi-Channel Forecast Template? By using the Forecast Template to document and analyze this important information, you can make educated decisions on how to adjust your media coverage and achieve the best result. This template will take the guesswork out of any spending doubts. After a short amount of time studying this data, you will learn which media outlets to allocate more money to, and which ones could possibly be cut altogether. This tool is useful in understanding your market place and the effectiveness of a specific media outlet, so start saving time and money today!